The number of ravens hanging out around campus has seemed unusually high to me this year. Each day there are 10-20 of them finding food to eat in the campus lawn. 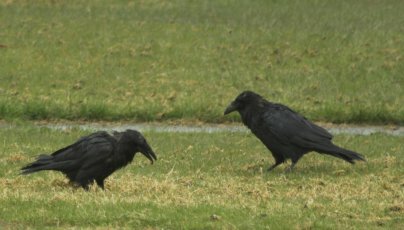 In past years I only remember regularly seeing 4 ravens through the winter and spring around campus. There are three possibilities I have thought of for the difference this year. It could be an artifact of my own incomplete observations and/or poor memory, it could be a bumper crop of whatever it is the ravens are finding to eat, or it could be due to the cold spring. I regularly see ravens up in the alpine when I am hiking, but this year there is still a lot of snow in the mountains. Perhaps they hanging out in town waiting for the snow to melt at higher elevations.